To view a list of payments, donations, and refunds, click Payments & refunds under the Finances menu. 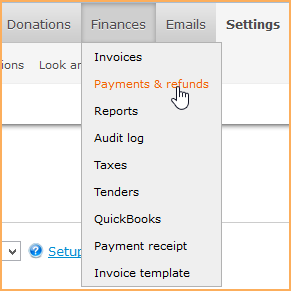 If a payment has an available balance, you can click the Settle button to match the payment against an invoice. See Settling payments to invoices for more information. You can filter the list to display certain types of transactions, or transactions within a certain time period. 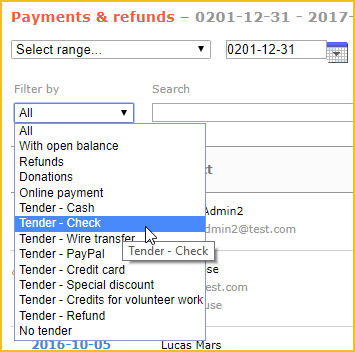 To filter the list by transaction type, click the Filter list and choose a transaction type or tender. To filter by date, click the Date filter list, or enter your own date range in the calendar controls, then click Apply. You can further filter the list by entering a Search string to be matched. Only records with the specified string will be displayed.